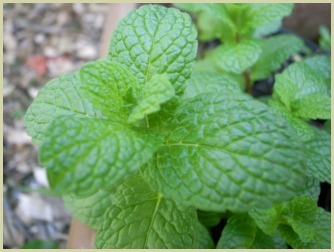 When growing mint, spearmint and peppermint are the two varieties most people choose, and are the ones I generally grow. There are about 15-20 you could try if available at your local nursery. Basil, apple, orange, pineapple and ginger are just some of the delicious sounding types. All varieties are hardy perennials, and once planted spread prolifically and if left unchecked can takeover your herb beds! I prefer to grow them in containers, this way the roots are contained and can't spread. If planting in the herb bed chop the bottom off a large pot and bury in the ground. Plant your mint in the centre and this will contain the spread. They prefer full sun but will grow very well in partial shade. It's not recommended cultivating from seed as they won't grow "true" and the flavour will be lacking. Much better from cuttings or root division. Like most hardy herbs, after a few years they get a little woody and produce runners. So in spring dig up an older plant and gently tease the roots apart in to 3-4 divisions. Replant in containers or the garden. Mint also tends to spread very readily, so doing this will contain it. Keep your varieties away from each other. If growing spearmint add some fertilizer prior to planting. If growing peppermint this is not necessary. Keep mint plants well watered. There are no real problems with pests. They can be susceptible to mint rust which looks like small rusty spots on the leaves. If you see this, you should remove and burn the infected leaves immediately. If this doesn't stop the spread, dig up the plants and roots and burn. This is another reason I prefer cultivating them in containers. If I happened to get rust, it's much easier to stop it spreading. You can pick sprigs and leaves for using fresh or for drying or freezing throughout the season. The more you pick, the more new growth you get. You can also use the leaves to make a healthy drink. Click here for my recipe. Spring: Take cuttings and divisions from established plants. Summer: Cut back plants for fresh growth. Take more cuttings. Autumn: Cut back any plants in the garden and containers. Add some mulch or straw for protection. Winter: Dig in some fertilizer ready for spring plantings.